Every Christmas Eve growing up, my family and I would wait outside our house for Santa to drive by with the fire department. He would stop, give us lollipops and wish us a "Merry Christmas!" Then, we would enjoy hors d'oeuvres like meatballs or perhaps a meal and open one gift, the present for each us from my aunt, uncle and three cousins in Oregon. I kind of outgrew this tradition and am so pleased that I replaced it with one I enjoy again. For the second Christmas Eve in a row, my mom came over to my apartment and the two of us baked desserts for after dinner on Christmas Day. I truly enjoy baking and my mom relishes the time together. Since I strive to be a domestic goddess, I do not love trying new recipes out for the first time for such a big event. Armed with a cookbook and a bookmark noting which pages of recipes she wants to prepare, this does not phase my mom whatsoever. I had never even seen anyone make cut-out sugar cookies, let alone make them myself! Anyway... for the sugar cookies, I found this recipe where you do not chill the dough, so that the two of us could make a batch together in its entirety. Again, I used my new French Kitchen marble pastry slab from Crate & Barrel to be the surface where I knead the dough, roll it out and then cut the cookies. We borrowed my sister's KitchenAid mixer to make the dough. 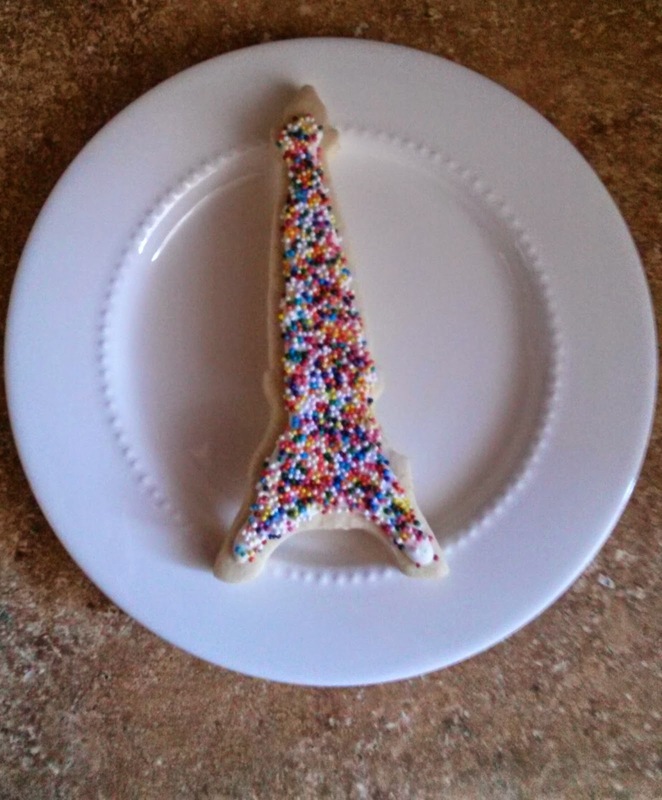 I also ordered three cookie cutters from Sur la Table, an ornament, a star and an Eiffel Tower. The sugar cookies turned out well, but I definitely need some inspiration (like this (from Elements of Style)) and to practicepracticepractice decorating them with frosting, sugar and sprinkles. I politely asked my mother to tell me the desserts she wanted to make in advance and I would make them multiple times and then she could simply assist me in churning it out on Christmas Eve. It is important to me that what I contribute taste delicious and look beautiful. I like this recipe and plan to use it again. You can really taste the 1/2 teaspoon of almond flavor.